On Monday 20th May from 6.00 p.m. at the French Institute in Prague the Czech Development Agency has prepared a screening of the new Czech feature-length documentary Vote For Kibera. The film, which won the viewers’ prize at the International Documentary Film Festival in Jihlava and currently has a rating of 80 % on the csfd.cz website, will be screened in English with Czech subtitles. The film will be followed by a debate with the film’s director Martin Páv and other guests. Admission to the event, held in collaboration with the Ministry of Foreign Affairs of the Czech Republic, is free of charge, although for capacity reasons a seat in the hall needs to be reserved in advance on the French Institute website. On the south-western edge of the Kenyan capital of Nairobi lies Kibera, one of the biggest slums in Africa, home to an estimated one million inhabitants. Kibera was founded by Nubian soldiers serving in the British colonial army, whom were provided with a piece of forest land a hundred years ago. The name of the slum also comes from the language of the Nubian settlers (kibra means forest). The locals also call Kibera the chocolate town, owing to its brown sheet-metal roofs. The idea of shooting a documentary in Kibera was thought up by Jiří Pasz and especially by development worker Eva Krutílková, who has been travelling there to help for more than ten years. During one of her stays she became friendly with two Kenyan filmmakers – the Okongo brothers – who had spent all their lives in the slum, and she had the idea of putting them in contact with filmmakers from the Czech Republic. The reason for this was that she did not like how Kibera is stereotyped and stigmatised in the media and how the negative media coverage also affects the local inhabitants. “She posted on Facebook saying that she was looking for Czech filmmakers to collaborate with African filmmakers, which she thought could result in a documentary that does not give a stereotypical view of the slum, but strives to understand the community there from within. This idea appealed to me and I immediately approached other people; we set up a crowdfunding campaign and that’s how it all started,” says film director Martin Páv, recalling how the documentary originated. The project took two years to implement; it was launched in winter 2016 by the aforementioned crowdfunding campaign, enabling Czech filmmakers to visit the slum for the first time. The team also included Simon and Raphael Okongo, who had grown up in the slum, letting the crew quickly become integrated into the local community. “We didn’t want to film another story that would be a mere interpretation of Africa through the eyes of Europeans. From the start it was crucial for us to get local filmmakers involved in the project, in order to present a balanced view, one that corresponded as closely as possible to reality. This resulted in a unique project, which was implemented by an international filmmaking team, but also with the participation of experts in international development,” claims Jiří Pasz, the man behind the idea. The crew spent a total of 5 months in the slum and got closer to their protagonists every day. For the whole time the film team lived in a little house on the edge of the slum in the same restricted conditions as the locals. The team went to Kibera not only to film, but also to eat, shop, and also relax and have fun. “I’m very happy to have had the chance to basically live with the locals. We found out that life in the slum is more than just suffering. Under all that “facade”, which does look extremely, sometimes horrifyingly different from what we are used to, there actually lies something that is very close to us – the desire to live and make our way in the world into which we were born. In the slum we found lots of admirable people, and especially made some close friends,” says director Martin Páv, recollecting the shoot. The central figure and narrator of the film is the young photographer Don, who has spent his entire life in the slum. Through his photographs he strives to show that Kibera is primarily a place with great potential, full of creative individuals who, through the slum, have learned to live life to the full, work towards a better future and thus defend their rights. They are the people whose activities are a substitute for the services not provided by the state and they clearly prove that not all Kibera’s residents are condemned to a life of misfortune. 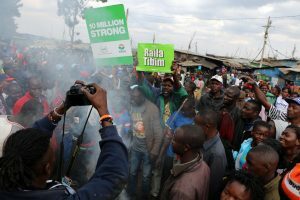 One of the most dramatic events of the entire shoot was the presidential elections in 2017, the results of which were contested by the opposition, including many inhabitants of Kibera. The tensions escalated into several days of post-electoral violence, with tens of residents of the slum losing their lives. The crew recorded these events and so the film also offers a unique view of these dramatic moments from the perspective of “ordinary” people. The problem of Kenya, like so many other African countries, is that elections are rife with tribalism. Kenya used to be home to more than 40 different ethnic groups, which, since the establishment of the colonial state and particularly since the country became independent, are supposed to call themselves one nation, which unfortunately does not always work. The people therefore elect candidates based on their ethnicity. If their candidate loses, they have the feeling that they have been defeated by a different ethnic group. And some politicians can take advantage of this. It is good to bear this in mind when seeing footage of burning tyres and riots in Kibera during the presidential elections. However, the main aim of the film is to breakdown the widespread notion that a city slum, let alone one of the biggest in Africa, is automatically the worst possible place to live in. Such a portrait has to end up as a depressing documentary full of human poverty and suffering. However, the creators of the film have managed to achieve just the opposite. Although it is an informal settlement that receives no services provided by the state, such as running drinking water or sewerage system, let alone functioning health care, schools or police force, the film shows Kibera as a remarkable and in many ways inspiring place with a unique atmosphere. The local radio station Pamoja FM, for instance, brings the community together by broadcasting news about all the good things that happen there, like the main protagonist in the film, Don, who tries to present the less familiar face of Kibera to the world by photographing local community projects and examples of civic activism. Life in Kibera is not easy and cannot be glorified. As the documentary shows, it is also sometimes a violent place. The film depicts, for example, how the people exercise mob justice against a thief, unfortunately resorting to such measures when they do not believe that they can expect justice from the security forces. In contrast, for the common European Don’s images turn the dreaded slum into a place where people from various ethnic groups are able to live together most of the time without any more fundamental conflicts. The positive vibe of the film is also enhanced by the excellent filmmaking, from the camera, editing and script to the wonderful music, using songs by local artists in addition to compositions by Ondřej Mataj. It is no coincidence that this powerful film took the viewers’ prize from the Jihlava festival and was also screened at the One World festival. “The fact that we stereotype and compartmentalise people and are then afraid of them, even though we do not know them, is completely stupid. We are afraid of what we have created in our minds. This is what our film is about. I think that we will have more and more to do with Africa in the future. And if we think of Africa just as being home to giraffes and uneducable savages, we will never start to work together. Or at the very least, very badly,” says Martin Páv, who also aims to have the film screened in Kibera and develop a debate on life in the slum, not only in Kenya. In the beautiful mountain landscape of the Georgian region of Tusheti the CzDA has been helping the local inhabitants since 2010. It has provided many of the households here with solar panels and has supported of the projects focused on sustainable forestry management, the provision of health care and emergency rescue services and the economic development of the region in the fields of tourism and agriculture. In one of its projects it has focused specifically on the development of the traditional livelihood of the Tusheti farmers, which particularly comprises growing local crops, including the introduction of hardier varieties, modern farming techniques and processing sheep’s wool. The remote mountain region of Tusheti lies at a height of almost three thousand metres above sea level and can only be reached via the Abano pass. It is inhabited only from May to October, as during winter there is not a single road leading here that is passable. The main source of livelihood for the local people is tourism, followed by agriculture, as well as grassland farming in the Pirikiti and Cova valleys. Although the number of tourists here is increasing every year, the local inhabitants continue to make their living in the traditional ways, i.e. mainly by growing potatoes and processing sheep’s wool. “The main problem here was a lack of demand for wool and an overall decline in the production of potatoes. The wool is also low quality, as the sheep were sheared in a variety of different ways and there was no equipment for cleaning the wool. Another major role in the decline in wool and potatoes has been that they are costly and difficult to transport on the unpaved roads connecting Tusheti with the lowlands,” says Tomáš Ďurana from Charita Česká republika, a charity that since 2015 has implemented the four-year project Support of the Traditional Livelihood Systems in Tusheti, funded by the CzDA. The problem with the fall in the production of potatoes was caused by the low yields, mostly due to ineffective growing techniques, lack of knowledge about soil fertility and the reduction in the use of land for growing. This was also clearly related to the lack of a market for the potatoes, due to the sheer absence of any form of marketing, thus exerting retroactive pressure to cut back on production. Yet Tusheti potatoes are well known in the region and prized for their quality; however, these varieties did not mature until the tourists, and hence the sales opportunities, had decreased. Both of these problems were also closely connected to the lack of any business planning or market analysis. “The bulk of the project that we have funded here comprised activities involving material, technical and methodological support for the development of traditional farming as a livelihood. This primarily involved growing crops such as potatoes, cucumbers and some tomatoes, as well as processing sheep’s wool in the mountainous Tusheti region. Much of this project was focused on supporting human resources, providing selected production inputs, and also coordinating sales of farm produce. Early varieties of potatoes were therefore introduced, which are now available during the tourist season. The project will strengthen the individual links of the value chain of sheep’s wool, potatoes and vegetables from primary producers, from transport, storage, processing and marketing through to the end consumer,” explains Kateřina Šimová from the Czech Development Agency, who is in charge of the project in Georgia. One important part of the project was the establishment of two agricultural cooperatives to secure selected production inputs and mainly to coordinate sales of farm produce. These two new cooperatives organise the purchase of potatoes from local farmers in ever increasing numbers. This has been the case with Nana and Emzar Mozaidze, who are members of the local “Tusheti 2015” cooperatives and main grow potatoes and cucumbers. As part of the project they were provided with a greenhouse, and during harvest time they pick up to 30 kilos of cucumbers a day; the potato harvest yields around 10 tons per half hectare. Another person who has benefited from the project is Kako Bukvaidze, who lives with his wife all year round in the village of Shenako and, in addition to other activities, makes a living from growing potatoes. They used to harvest 4 tons per hectare, but now their harvest with a different variety of potatoes and more effective techniques has more than doubled to 10 tons per hectare. Besides this, through the project they were also provided with a herb drier, which helps them to preserve their aroma. They then sell these dried herbs during the year. The local shepherds were then provided with mechanised shearing equipment containing 24 modern shearing machines. One of the people who has taught these local shepherds to use, put together and maintain this equipment is the experienced teacher Stefanie Kauschusová, who makes a living teaching sheep shearing all over the world. As part of the project the village of Alvani was provided with two automated tanks and a drier, which has greatly helped to make processing sheep’s wool more efficient and increase the volume processed. Support has also been given to certain beekeepers, such as Irodi Bukhaidze, whom the project has provided with the necessary equipment, enabling him to expand to managing 10 hives, which yield an average of 100 kilos of honey. Like Onise Itchirauli, who began to keep bees through a small grant programme for start-up entrepreneurs listed as part of the project. In the last season he harvested 200 kilos of honey. Another area in which CzDA projects strive to help improve the local standard of living is tourism. A few years ago the region was visited by more than 11 000 domestic and foreign tourists, including a lot of Czechs, who have an excellent reputation here. This is not only due to the projects described above, but also due to the Czech volunteers that regularly stay here, who have marked the main footpaths and hiking trails in the region. The number of tourists is thus increasing every year, naturally accompanied by a rise in demand for accommodation. In the village of Omalo, which is the starting point for many tourists, preparations are under way to build the Marine Ghuzarauli hotel. This bold step is inspired by the success of the village’s small café “Khavitsi”, which serves local specialities and is never short of customers. Natia Bakuridze has already got her hotel business up and running. Besides accommodation, her little hotel “Shina” also offers sweet pastries and confectionery. She also prepares special dried food for mountain hikers. There is no wonder that on booking.com her hotel has a rating of 9.2 out of 10 and she plans to expand her successful business by opening another hotel in the village of Iliaurta. Lela Arindauli then started up a family business in the picturesque village of Girevi. Her hotel “Nadikurta” is very popular with tourists, partly due to the solar panels provided by the CzDA under the project, thus enabling her to expand the services she offers in an environmentally-friendly way to include internet, hot water and heating, thus doubling her profit. Thanks to her success her parents have also returned to their home village, after living in Russia for many years. Kavtar Darkizanidze also spent many years abroad and for a long time it did not look like he would ever return to Tusheti. However, after many years spent in Ireland, he eventually decided to return to the now partially depopulated village of Djvarboseli and, with the support of Czech programmes, has opened the “Poshol” guesthouse. From the stories of the Tusheti region’s farmers it is clear that one of the most effective means of helping developing countries is to support the local people in becoming independent and to show them that with their products they can support their families and develop tourism in the mountains. “I think that the main positive impact of the project is that it has changed the way of thinking and the approach in the Tusheti community, which originally was strongly resistant to any change, i.e. changes in established farming procedures or in relation to other economic activities. This change, no matter how long and difficult it might be, has helped to kick-start sustainable economic development in the remote Tusheti region and make agricultural production more efficient,” adds Kateřina Šimová. After the feasibility study, which assessed the potential of the moringa tree for the development of Ethiopian communities and the development and marketing of new products on the Ethiopian and foreign markets, the actual implementation stage of the project was successfully launched with the support of the B2B Program. The project entitled Harnessing the Economic and Social Potential of Innovated Products from the Moringa Superfood from Ethiopia now directly affects around 50 local residents with education or employment, and others will join their ranks this year after the production and sale of moringa tablets and moringa oil is launched. Thanks to the work of the team led by the implementer Jaromír Novák, the healthy products from the Ethiopian superfood have also already reached the Czech market. Moringa is a genus of deciduous or evergreen trees that can grow to a height of up to 20 m. In both their boiled and raw state, the leaves are a very wholesome food, and they are also dried for periods of scarcity. In Ethiopia, moringa is used mainly in the form of fresh leave as an equivalent to our sauerkraut, cabbage or spinach. Another reason for its popularity is the fact that it does not need any special care, it grows fast and it can be harvested several times a year. Despite the fact that it has been used in traditional medicine and knowledge of using its root as a medicine against malaria has been passed down for generations, the beneficial effect that consuming the leaves has on the blood pressure and digestion and its high content of antioxidants and substances that are beneficial to the body were completely unknown to the Ethiopians. A fundamental change occurred about eight years ago, when articles about moringa started to appear in the media. The “daily bread” of the poor became a “superfood”, and the disdain of rich Ethiopians for moringa disappeared. This was an opportunity for small farmers, as well as international and government organizations, which organized countless training courses, educational courses and provided material or financial support to newly established cooperatives. “The activities under our mojeMORINGA project that are taking place on the shores of Lake Abaya near the south-eastern city of Arba Minch began in 2015, when we established cooperation with 17 farmers cultivating moringa. After receiving training under the Czech project, the farmers can harness much more of its potential. They can transport or ship properly dried, processed and packaged moringa much further than just the local marketplace, which opens up a much larger consumer market. This, of course, brings profit to families that not only helps to ensure the necessary nutrition, healthcare and education for children, but can also motivate other young people. They can then take up the agricultural and commercial activities of their parents and do not have to leave their homes and look for work in another region or even another country,” says project manager Jaromír Novák, who founded the project together with botanist Petr Němec. At present, forty farmers from two agricultural cooperatives, who are trained in techniques for the proper cultivation, harvesting and processing of moringa, including hygiene and the proper packaging of raw materials, are directly involved in the project. In the next part of the project, which deals with the processing of moringa for various products, a production hall in which moringa oil and moringa tablets will be pressed is now being equipped. By processing the raw material for these products on the spot, the added value will remain in the region and more jobs will be created for local residents. After production is launched, roughly another ten young people will be employed, and another 150 farmers are periodically supported in the area through the purchase of moringa leaves and seeds. “Last year, we managed to provide quality facilities for the production of moringa tablets and moringa oil. Machines were purchased and commissioned and production was launched. The production of moringa oil was launched first. The results are in for all the necessary laboratory analyses proving the excellent quality of the moringa oil and its conformity to all EU standards. The moringa oil is currently being marketed for sale in the Czech Republic. Work on the design, strategy and marketing for the introduction of the products onto the Ethiopian and European markets is currently underway, “ adds Jaromír Novák. The production of the tablets will begin in the spring. The project work is carried out according to a timetable, despite the fact that Ethiopia is currently in a period of transformation after its change of government, resulting in civil unrest. The success of the project is also driven by the reliability of the local partners, namely cooperating women’s cooperatives and the project partner Betigil Feleke. Another benefit is the support provided for the project by the Ethiopian government, which is accommodating the project team by providing land for the cultivation of moringa and leasing production facilities in the premises of the business park in Arba Minch, where innovative moringa products are being produced. This year, the sale of new products in both Ethiopia and Europe should begin in the spirit of the principles of fair trade. “It’s great that the implementers have also succeeded in kicking off a follow-on investment plan with our support after the feasibility study. The positive impacts of the project include not only the transfer of know-how and the development of technologies for processing agricultural products, but also the creation of new jobs and increased competitiveness on the Ethiopian and foreign markets,” says Ludmila Leškovská, who is in charge of the B2B Program in the Czech Development Agency.